At Swan, our youngest patient is 1 and our oldest is 97. As you can see we cater for all ages! But did you know your dental needs change over the years? Remember to brush the inside of your teeth as well as the outside! Our payment plan is cheaper for our more junior clients, as they have fewer teeth to examine, and do not build up tartar like adults do. However, we are sticklers for good toothbrushing and healthy eating.... sweets and fizzy drinks are for occasional treats only! Both our dentists have young daughters of their own and enjoy the fun that young patients bring to the surgery! We also have the services of Dr Rose Bannister a specialist in paediatric (childrens) dentistry. Rose does not have a clinic with us but is able to advise on more complex or unusual cases. Many young adults these days have only a few fillings and look after their teeth fairly well. So why bother going to the dentist? Firstly, if any small problems are developing, we can help to correct them before they become large problems. If spotted early enough, we can use preventative techniques that do not require a filling. Secondly, approximately half of all adults are likely to develop gum disease, and this usually begins in your 20s and 30s! 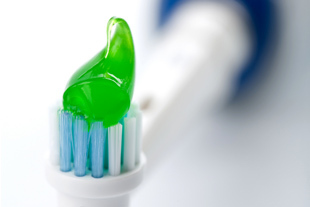 Many of us brush our teeth fairly well but have never been shown how to clean our gums effectively. We will show you how. Looking to improve your smile, or maybe your lower incisors are beginning to crowd together? Have a look at our tooth whitening and invisible orthodonticssections. The chances are, you have looked after your teeth reasonably well, however you have quite a few fillings and other restorations, some of which may have been there for many years. We will NOT try to talk you into having everything immediately changed to new white fillings: old amalgam (silver) fillings can last a very long time! However, if there are cracks within teeth, decay under fillings or crowns, worn down areas, or non-vital teeth, it is better to correct things now rather than wait and hope problems go away: they won't! Look at our cosmetic dentistry section to see how we can help. If you have been wondering about having that missing tooth replaced, how about a bridge , a flexible denture or even an implant? We can help. Times have changed: most seniors want to keep their own teeth for life, or perhaps have only a partial denture where previously they may have had full dentures. Thankfully, modern methods can help you keep your teeth where previously they might have been unsaveable. 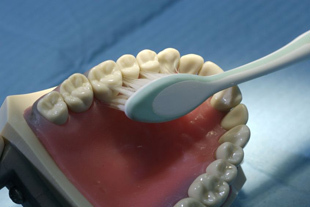 Your teeth may be more susceptible to root decay - we will ensure you are able to clean these areas effectively. Most importantly, we will not make assumptions based on your age. We have done white crowns and tooth whitening for patients in their seventies and eighties! For those with full dentures, we offer a reduced payment plan with one oral examination a year. If you require new dentures, our dentists will be happy to help. At Swan Dental we care for you and your smile. We use the latest techniques to give you a whiter, straighter smile. Dentists Harrogate - Fluoride applications and fissure sealants (tooth coloured sealants) are applied to biting surfaces of children's teeth to prevent decay.